This cultural studies kerfuffle comes at an especially bad time for me, since (as I will now admit on this blog for the very first time) I was nominated this year to run for the post of Second Vice President of the Modern Language Association. This is, in effect, a presidential election, since VP-2 in 2010 becomes VP-1 in 2011 and President of the MLA in 2012. In July, a spokesperson for the White House indicated that there was a good chance Obama would not honor his secret promise to replace Joe Biden with me on the Democratic ticket in 2012 (yet another betrayal, and this time it’s personal), so I decided to accept the MLA nomination. My opponents, it turns out, are Kwame Anthony Appiah of Princeton and David Damrosch of Harvard, each of whom hails from the profession’s A list of distinguished professors, whereas I’m just some guy from Penn State with a blog. I am clearly a very, very long shot for the post, and for weeks my advisors have been telling me that my only chance at closing the gap is to spread the rumor that Appiah was born outside the US. But that was before I published that essay on cultural studies. Now, I hear, faculty and graduate students in the modern languages are gathering across the nation to demonstrate against my “death panels” for cultural studies programs. This is a grievous misunderstanding, and I want to try to straighten it out right now. I called for plenary panels on cultural studies, not death panels. As I have long argued, the problem with cultural studies in this country is that people wait too long to see a cultural studies theorist, and only when their perplexity becomes acute do they show up at one of our understaffed and overworked Emergency Centers for Conjunctural Analysis. There, they get the historicization and contextualization they need, but it’s mostly triage, and it’s very costly. This state of affairs is intolerable—and, over the long term, unsustainable. As MLA President, I would move quickly to form a number of committees to study the crisis. Some of my colleagues have urged me to support a “public intellectual option” that would allow people to seek out introductions to Žižek and Butler at a fraction of the cost of private-university tuition; this is but one of many options on the table, and I pledge to honor the objections of MLA members who will not support such an option if it doesn’t have enough support from people who oppose the option, as well as members of my own party who will not vote for it on the grounds that it doesn’t have enough votes, even if their own yes votes would be more than sufficient for its passage. There remains the possibility of forming cultural studies cooperatives, as was done to great effect in the Birmingham Centre itself. And now, at long last (ten days later! ), it’s Jamie’s birthday party! Unfortunately, we had to penalize them 15 pins for excessive celebration. Showboaters. Eight kids of various ages and abilities joined Jamie for the big event, which was great, because last year, when we threw him his first party since 2003 (we were afraid teenager birthday parties would be too infantilizing—eh, what did we know? ), precisely two people came. Apparently, a lot of invitations in the backpacks of members of his peer group never made it to the parents, which is kind of an occupational hazard with this peer group. So this year, I showed up at school during Jamie’s lunch period and handed out invitations personally and talked to his teachers about how to get in touch with people who aren’t in his classes, etc. Though some kids had conflicts with the date, we had a fine turnout and a fine time. Which is both a joy and a relief. No, I have no idea why Jamie did that with the Penn State shirt he’d received as a present. 18-year-olds are weird. But he had fun, as did everyone else, and my advisors tell me that’s the important thing. Thanks to everyone who sent Jamie congratulations and good wishes! I was nominated this year to run for the post of Second Vice President of the Modern Language Association. This is, in effect, a presidential election, since VP-2 in 2010 becomes VP-1 in 2011 and President of the MLA in 2012. The return of American Airspace explained! Who will be your Sister Souljah? Is it Cultural Studies itself? ... wait, how does that work ... maybe you’re aiming for the “Roger Kimball vote”. And the WAAWACBNP (We Are All Wild and Crazy Bowlers Now Party) looks like great fun. The return of American Airspace explained! Naaah, I just couldn’t stand mds’ chant of twen-cen, twen-cen. Like “1940” to a Rangers fan back in the day. That was very good; you should always have a plausible denial ready for any blatant pandering you have to do on the campaign trail. You have potential! Hey, you’ve got my vote! Oh, wait, I don’t belong to the MLA. But I could sure use some low cost Butler interpretations. And congrats on your great kid! 18. Wow. Will you also propose a new method for dating the beginning of the modern language period using the new log of 13+5??? This seems appropriately arbitrary. There, they get the historicization and contextualization they need, but it’s mostly triage, and it’s very costly. This state of affairs is intolerable—and, over the long term, unsustainable. This still leaves the philosophization to non-care givers on the other side of campus, where they will pick through the rhetoric to find reasons to deny it all. 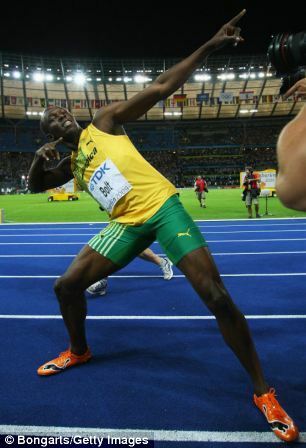 And Jamie’s shotput pose is so well-schooled, as if he truly is a natural for that event. Shot put? Maybe, but I thought Lightning Bolt. Anyway, looks like a good time was had by all at Jamie’s party. Which is what we’ll be saying after the Bérubé victory party at the MLA too, I’m sure. I am very concerned about these death panels, Professor. That was very good; you should always have a plausible denial ready for any blatant pandering you have to do on the campaign trail. And I already have extensive experience being blamed for everything, so it’s win/win. Oh, look, it’s the undercarriage of another bus. whereas I’m just some guy from Penn State with a blog. You’re selling yourself way short, here. You’re a whimpering antifeminist patriarch from a gold-plated private university in the midst of one of the most liberal regions of the country. Or so the entire faculty of UC Davis led me to believe. Also, you have a blog. And Putin is so Noughty. We’re on the cusp of the second decade of Twenny Won, after all. Perhaps a photo of… the future president of the MLA? Glorious show trials. With music, and dancing! This sounds like what you said back in the winter of 2006, when your humble blog was up for a prestigious award, and your competition included some young hot-shots from an Ivy League school (I think it was Columbia). You won that award by not resorting to cheating. This time, though, you might need more grit. I suggest town hall debates with your opponents--in the halls of the Internets. Let’s hear what the other fellow have to say about death panels. I personally like the death panels idea. For starters, we could bring back Derrida and get him to explain that sexual harrasment hush up. What the f**k was he thinking? I am clearly a very, very long shot for the post, and for weeks my advisors have been telling me that my only chance at closing the gap is to spread the rumor that Appiah was born outside the US. I hear ACORN is available. You won that award by not resorting to cheating. No, I won that award by saying that the Ivy blog and I had to crush the homeschoolers, thus leading to a culture war with the homeschoolers, who rose up as one and nearly beat me despite the fact that their chosen blog was defunct. The lessons for this election are too horrible to contemplate. Now that’s political savvy! I was going to round up selected MLA voters in FEMA camps, but that wouldn’t go over very well with the Agamben crowd. ACORN is definitely the way to go here. Naaah, I just couldn’t stand mds’ chant of twen-cen, twen-cen. Maybe you should start an explicitly retro parallel site. Sandanistan Airspace etc. Or wait, the threat* was that they were a day’s drive away. I don’t know, Sandanistan Highways, whatever. *A stark and early (for me)illustration of something along the lines of the manufacturing consent model was when some NYTimes poll showed the (different but similarly situated)Salvadoran Civil War as the top concern of Americans. Oh, really? Appiah was born outside the US. And Damrosch murdered Vince Foster. The party looked like great fun, and, most importantly, no one burst into flames. It sounds to me like you need a campaign manager for this MLA thingy. The job would start with pinning the blame for global climate change, the furlough of Willie Horton, and the torture memos on your opponents and it would end with you being declared president for life and having your name engraved on the Stanley Cup. I’m confident I can accomplish all of this if the job is still open. Can you eventually get the name of this blog changed to Berubian Airspace? 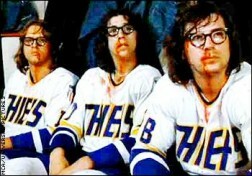 The version of “Slap Shot” played on Versus last night was an abomination! The carefully crafted language of this delicate script was distorted by the PC police headed by Appiah and Damrosch. Let me just say that a Berube Administration would never permit this infantilizing need to censor great American films. Whoa, this Atwater fella is good. He’s the best, mds. And the way I figure it, if an MLA president can’t bring you an unexpurgated Slap Shot on the cable kickboxing channel, what is the office good for? Nope, you lost my vote with all of the flip-flopping of your blog name. I’m having a helluva time keeping your position straight--and spelled correctly--on the links list over at my student-run blog. Honestly, Michael, you’re not being much of a role model for the children. What will they think? What kind of future will you provide for them? What kind of future will you provide for them? I believe that children are the future, Professor Fisher, unless they’re not, in which case I believe we’ll wind up in that Children of Men scenario. But I can promise to lead us, in either case, to an American or Qaddafian or Chávezian future, as my whims dictate. I believe that children are the future, Professor Fisher, unless they’re not, in which case I believe we’ll wind up in that Children of Men scenario. In which case, only Captain Jack Harkness can save us… Whoops, wrong Children. And the way I figure it, if an MLA president can’t bring you an unexpurgated Slap Shot on the cable kickboxing channel, what is the office good for? That continues to knaw at me. What is even the point of showing a sanitized version of Slap Shot? It was crazy enough to encounter the network TV version of Ghostbusters, with its talk of “Wally Wick.” But such a hockey classic without the filth? I blame George Scialabba. I just noticed that best case, you wouldn’t be MLA prez til 2012. Since Esperanto will the only language in use at that time, you probably won’t have much to do. 2012. Isn’t that when the world is coming to an end? Surely the occasion for a public option GNF to go with all those death panels. It’s also Alan Turing Year. Time to Break and Transgress All Codes. Something is seriously flawed in the time/space continuum when there is a Micheletti doing horrible damage to civil liberties in the place between Salvadorian and Sandanistan Airspaces. It could be a Mayan 2012 glitch, or perhaps a transgression of MLA election code, but a Michael-based surname should not be the perpetrator. Apparently Senator Creme de Menthe doesn’t seem to have a problem with it. Whatever brought the thing about, I am delighted at the return of the ginormous looming head. I am enamored of the ginormous looming head. It’s a personal kink, ok? More importantly, however, you should update your sidebar to recognize Jamie’s having accumulated 18 years (on which I congratulate him heartily). My memory of such a time in my own life is dim, but I’m quite sure that no 18-year-old young man would wish to be advertised to the world on his father’s blog as a mere sprout of 17. As for “excessive celebration”, dang, you’re a hard-nose. If a guy can’t dance in the end zone - or the bowling alley equivalent - on his birthday, when can he? I know JoePa, the all-knowing one, always says, “Act like you’ve been there before,” but Jamie hadn’t been there before as an 18-year-old. That’s big time. I’ve belonged to the MLA for a while now. I don’t suppose I’ve ever voted in an MLA election (I’ve been watching Carly Fiorina’s kids for her), but maybe I’ll get around to it this time. I can be bribed, is what I’m saying. I want cultural studies communes, myself. Or how about brothels? And lastly, glad to see you had real bowling. I never saw candlepins till I was in college, and scorned them mightily, as a good Jersey girl must. Happy birthday to J. 18, wow. Ah, never mind, a quick google tells me DD went to Harvard. Bet they’re getting each other’s mail. If you are truly watching Carly Fiorna’s kids for her, the last sentence about your “bribability” is clearly redundant. captcha cannot as in I cannot for the life of me understand why Carly can’t watch her own kids. so, bowling: harmless fun, antinomian subversion, or a pure reflection of the corporate class that produces it? The answer is always (c), Colin. For bowling, and for everything else. Heidi—yes, my opponent is definitely David. Any tips on running against him? I hear he torpedoed our bid for the 2016 Olympics, but I’m not sure MLA members care about that. Any tips on running against him? (1) He doesn’t have his own Wikipedia entry, so that’s a potential wedge with the digerati wing. (2) Abandoning the highly-regarded English department at Columbia to become chair of Literature and Comparative Literature at Harvard? Seems rather preoccupied with status to me. (4) “Pop culture is fun! Tee-hee!” --David Damrosch to Robert McChesney at a recent cocktail party, just before re-enacting the Janet Jackson Super Bowl incident with John Hamilton. And isn’t anybody impressed that I haven’t said, “vote for me and all your wildest dreams will come true”? I mean, the self-restraint is astonishing, I think. Yeah well now you have another serious problem. You can thank Rio for that. Now Africa will be the only continent that has never hosted the Olympics. You think that Kwame guy isn’t going to milk that one? I think you should campaign on “lower ATM fees”. A sure winner. How about “A Stuart Hall library on every kindle”? Now Africa will be the only continent that has never hosted the Olympics. A-hem. Antarctica? MB can cut off the Kwame Maneuver via a penguin-centric appeal. And penguins are oft-invoked symbols in the Linux community, so that’s a potential wedge with the digerati wing. Also, since Stuart “Kids in the” Hall is still alive, how about a surprise celebrity endorsement? Ideally involving a blimp with “EVOLution” printed on it. No, wait, I’ve got it. Challenge the other candidates to a floating signifier race. And we’ve got at least three penguin movies to draw on, two animation and one live action. Cult Studs, GNFs, penguins, public THEORY clinics, Show Trials, happy-footed penguins, what a platform!!! Oh, right, Bill. And leave me wide open to the “suppressed in this Hallocentric platform is any alternative account of other alternative readings that might have been kindled elsewhere” critique. yeah well, climate change will make that little detail go away pretty damn soon. Nothing like a good ol’ GNF to create Enhanced Climate Change for All. Ahem, bedrock beneath the ice. Well, just activate the whole anti-elitism spirit, and you’ve got it in the bag! Unless, of course, your opponents like to haul brush around their large ranches, in which case they are Self-Made Men with who (not whom) the voters would like to have a beer. Oh, i can see it now, a new reality show on ET the Professors of Cultural Studies: the MLA election. Enhanced DVD with added bonus features of the candidates discussing penguin cultural diversity, and the boys themselves demonstrating jocularity and collegialism whilst savagely stabbing one another in the back with blog commentary and journal critiques. Perhaps they could film a sequence on Antarctica to complete the series? have you actually “SEEN” the bedrock? It’s just propaganda from the “Antarctica 2024” crowd as far as I can tell. Going bowling for a birthday party for young people..that’s a good idea! It’s fun, they use up their energy...no need to clean the house after the party. Everybody’s happy!